All week long, a chance of storms on Friday night, Sept. 21, had been predicted for North Texas. And, while few will decry some rain around here, football fans were hoping it wouldn’t be so bad that the games were canceled. The teams and coaches prepared for the worst. Many teams in the Fort Worth-Dallas metroplex area moved their Friday games up to Thursday, and several others, including Breckenridge and Brock, moved up the Friday kickoff time. The game started at 7 p.m., instead of 7:30. The predictions were not wrong. 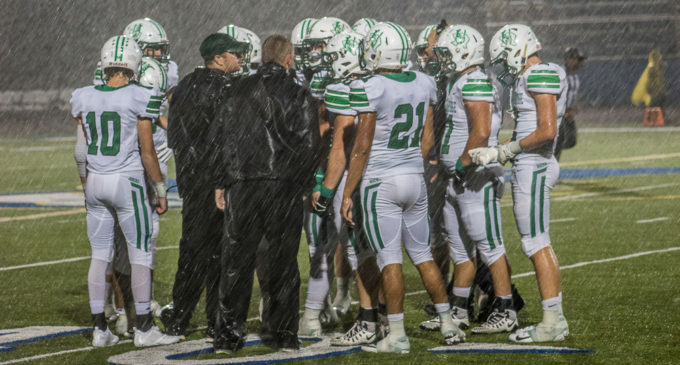 About 15 minutes before the Buckaroos and the Eagles were scheduled to start their game, the clouds over Brock High School’s Eagle Stadium opened up and let loose some torrential rain. But, minutes before the two teams ran onto the field, the rain stopped. The precipitation break lasted through halftime, allowing Brock to have their homecoming activities and for the Pride of Breckenridge-Buckaroo Band to perform. But, just as the third quarter started, the rain came pouring down again. It was just rain, though, with no thunder or lightning, so the game played on. The Buckaroos put the first points on the scoreboard, making a touchdown with 9:54 left in the first quarter. Breckenridge High School junior Owen Woodward threw a touchdown pass to senior Kevin Franco. BHS junior Justin Bell’s kick was good for the extra point, and the score was 7-0. About a minute later, the Eagles responded with a touchdown of their own. At 8:50 on the clock in the first quarter, the score was tied at 7-7. And, that’s where the score would remain through the second and third quarters. Immediately after the halftime, the rain started with a few sprinkles and within minutes was coming down in torrents, again. But, about a minute and a half into the fourth quarter, the Brock Eagles scored another touchdown. 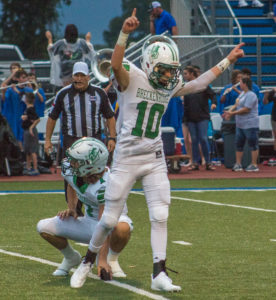 The Buckaroos blocked their extra point try, and then BHS senior Kyler Knight recovered the ball and ran it all the way down the field for a defensive 2-point conversion. That took the score to Buckaroos 9, Eagles 13 with 10:28 to go in the game. As the rain continued, Brock made the final score of the night at 3:49 on the clock with a 59-yard touchdown. With the extra point, the score was Buckaroos 9, Eagles 20. While it was raining in Brock, the same thing was happening in Breckenridge. According to the National Weather Service, the official rainfall in Breckenridge on Friday, Sept. 21, was 3.22 inches. During one of the storms that moved through the area, a transformer near radio station KLXK in Breckenridge went out, and the radio station was off the air for most of the Buckaroo game. The Buckaroos will take on the Dublin High School Lions for the BHS 2018 Homecoming game. After beating the Brady High School Bulldogs 20-7 on Thursday, the Lions are now 4-0 for the season. The Brady game was Dublin’s lowest score so far this year. They beat Hico 45-28, Albany 26-20, and DeLeon 46-23. Last year, Dublin’s record was 3-7 overall and 1-4 in district. In the Buckaroos’ 2017 Homecoming game, the Lions came out on top 27-24. It was the first time Dublin had beat Breckenridge in the past six games. Dublin is a 3A-Division 2 team and is in the same district as Comanche, Jacksboro, Millsap, Rio Vista and Tolar. After next week’s BHS Homecoming game, the Buckaroos will have a bye week on Oct. 5 before starting district play on Oct. 12 against the Jim Ned High School Indians in Tuscola. For more photos, click here to see the Breckenridge Texan Photo Gallery.